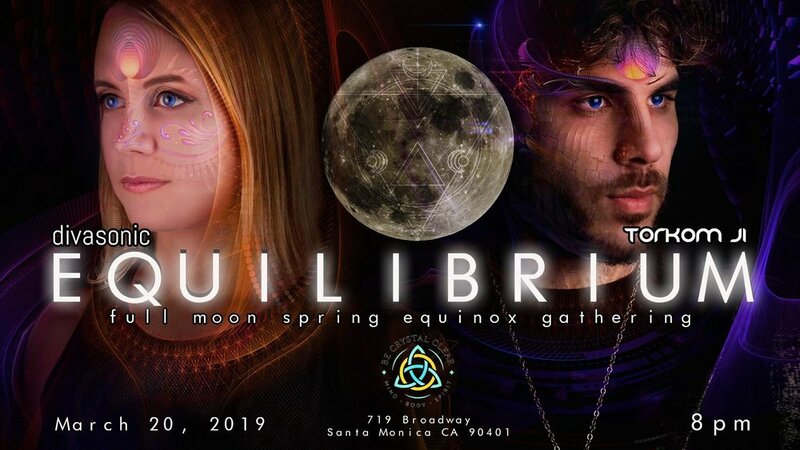 Join Master Sound Meditation Facilitators Torkom Ji & Divasonic (Lynda Arnold) as they guide you through this powerful Vernal Equinox and Full Moon transition. Spring is a time of renewing, blossoming and rebirthing. The Vernal Equinox has equal hours of day and night. The sun and the moon are in a perfect dance. Through this collaboration we explore and integrate masculine and feminine energies, bringing the listener into EQUILIBRIUM. We are also celebrating the birthdays of Torkom (3/20) and Divasonic (3/21) with cake and everyone who attends will receive a download of their new Solar Theory music EP. Burning Man 2018 - We were honored to create soundscapes and perform in Lucent Dossier’s Multimedia Transformance ‘Human Initiation Project’ in the Playalchemist Pyramid. Lynda handled playback of sounds and drones composed by Torkom Ji, played multiple instruments and led the opening sound healing ceremony. Solar Theory tracks ‘Submerge’ & ‘Sonaric (Vocal Version)’ were a part of the performance accompanying the aerialists and dancers. *Groundbreaking and award winning drone video by Ian Montgomery of sfdrones.tv featuring ‘The Journey Continues’ from the ‘Race the Sun’ album. We are back this year at Lighting in a Bottle 2018 in the Yoga Sol Tent! On Friday Torkom Ji performs a solo Quantum Harmonix set and On Sunday Solar Theory takes over with a live yoga set at 3pm and 10pm Language of Light Sound Meditation Ambient set with Michael Strauss on visuals. Join Us for a Special evening of Meditative Music and Healing Sounds with Special Guest Handpan Master Kabecao. He is currently on his US 'Touching Souls' Tour and has a full set of original Handpan music to share. We will be weaving and improvising our sounds together and ending with a Solar Theory ambient style set to close out the evening. *Celebrating Solar Theory 'Race the Sun' Album Release! Join us for this special event to celebrate the release of Torkom Ji and Lynda Arnold's collaborative album project, Solar Theory, presented by the Visual Reality Collective. They will be playing the entire Race The Sun album accompanied by the magical visuals of Michael Strauss. **Bring some pillows to lounge on in the space... we are creating a chill environment where you can lay back and enjoy the live performances all night! Their sound meditation offering called 'Language of Light' is an ambient listening experience designed for deep meditation, healing, inner exploration and relaxation. Their sound healing collaboration centers around creating a safe and grounded space to dive deep within the mind and spirit. The purpose of creating space for internal sound journeying is to resolve and release tensions, receive answers, and cultivate a deeply restful state of integrated awareness. The Language of Light sessions often incorporate vocal meditation exercises like toning, chanting and breath work to help participants drop into the experience and connect more intimately with themselves. It is a journey of deep listening. They have shared this experience at dozen of events, festivals and yoga studios. Lynda Arnold is a sound meditation expert, vocalist, instrumentalist, composer and seasoned performer on a life long mission to build healthy communities through the power of sound and music. She offers sound healing workshops, private sound baths and singing for wellness sessions in Los Angeles and has appeared at Shakti Fest, Bhakti Fest West, Lightning in a Bottle, Burning Man, Unicef Masquerade Ball and Lucidity Festival among others. Her intention is to provide a gateway for people to reduce stress, transform consciousness and heal through sound and meditation. As a multi-instrumentalist, recording engineer and music producer, she has spent years collaborating with other artists and bands and touring in support of her releases. She has multiple album and single releases on labels EMI, Clubstar (Germany), Geomagnetic (San Francisco), RTFM/Sugo (San Francisco), Epiphyte (San Francisco), Temple Music Group (San Francisco) and her own imprint, Digital Bliss Recordings. Lynda is also a seasoned music and audio production educator and writer, most notably for Ask.Audio. She is always learning and integrating new knowledge to infuse in her art and keep the flow of inspiration alive. Torkom Ji is a master sound healer and sonic architect from Los Angeles. Voted Best Sound Healer by the LAist.com, h e has been facilitating group sound healing experiences since the summer of 2012, and has provided deep meditation and rejuvination for thousands of people using his unique and powerful modality. His sounds have been experienced and at various therapeutic sound spaces at many festivals including Lightning in a Bottle, Lucidity, Shakti/Bhakti Fest, Indigo Vortex, and more. Birthed from his studies of music, vibration, energy and the practice of meditation and martial arts; Torkom has mastered and perfected a system that is known to put people in very deep states of consciousness, with little to no effort. Using a synthesizer in 432hz tuning, Torkom weaves soundwaves and harmonics live, and in real time. Through the natural movement of these sounds, deep rest is achieved and the bodies own intelligence facilitates an elevated level of healing. His system, Quantum Harmonix, is a one-of-a-kind, sound based healing technology. It uses live synthesis, 432Hz pitch, sacred mathematics, and is performed live, through a meditative state. All produced sounds are in accordance with natural law, natural movement, and structure, and have profound effects on the mind, body, consciousness of an individual.